On 3 July, Belarus’ national holiday commemorating “Freedom and Independence,” President Aliaksandr Lukashenka informed war veterans that Belarusian independence was achieved by the “generation of victors” who sacrificed their lives to free the country from foreign occupation. Of all the republics of the USSR and members of the Anti-German Coalition, he added, Belarus was hit the hardest by the war. But how is a war that ended 68 years ago related to the modern state? There is a tired old cliché that Belarus is a Soviet theme park, a phrase overused in the West, most often on Internet tourist sites. Most Belarusians do not want a return of the Soviet Union, but they do have some ties to a Soviet identity, one that has been consciously and deliberately fostered by the Lukashenka presidency and linked to the USSR’s victory over Nazi Germany. The crucial event of the past is the Second World War, but that designation refers to the entire period 1939-1945. In Belarus focus is on the “Great Patriotic War” that started with the German invasion of the Soviet Union on 22 June 1941. This sudden attack ended the 1939 Nazi-Soviet Pact of August 1939, which had divided eastern Europe between Stalin’s USSR and Hitler’s Germany. In 1939-40, Stalin annexed eastern Poland, the Baltic States, Bessarabia, and northern Bukovyna. The war remains a painful memory for residents of Belarus. But the historical record is distorted by state propaganda reminiscent of the late 1960s and 1970s, when Leonid Brezhnev was General Secretary of the CC CPSU, and former partisan Piotr Masherau headed the Belarusian Communist Party. Most of the major memorials to the war in Belarus, such as Khatyn (1969) and the Brest Hero Fortress (1971), date back to this period, as does the recognition of Minsk as a Hero City (1974). As Andrej Kotljarchuk of Södertörn University in Sweden noted in a recent article in the Journal of Belarusian Studies, it was Masherau who declared in May 1965 that one in every four residents of Belarus had died during the war and Lukashenka in a speech of July 2004 who amended this figure to one in three, and subsequently by sheer repetition created what has come to be accepted as an indisputable fact. Total human losses in Belarus during the war are estimated officially at 2.2 million. The Belarusian Ministry of Statistics yearbook maintains that the population in 1940 (including the western territories) was just over 9 million. Unless that figure is seriously in error, that would mean that if there were one-in-three human losses, the total would have been 3 million, or 800,000 more than officially stated. But unraveling state propaganda needs to go further. Who were these people? According to the 2011 textbook of the Institute of History, National Academy of Sciences (2011), edited by Professor Aliaksandr Kavalenia, over 1.4 million were civilians and 800,000 were former POWs of which “a considerable number” were people from Belarus. What does “a considerable number” mean? A majority? It is unlikely, given the reported mobilization of 500,000 Belarusians at the start of the war, or about one-sixth of those garrisoned in the Western military district in 1941. Many historians also consider the 1.4 million civilians total to be significantly overstated. Crucially, there is no separate mention here of the Holocaust in Belarus and Jewish deaths, which amounted to around 600,000 or 43% of civilian losses. Today, the number of Jews living in Belarus, formerly an integral part of the Pale of Settlement, has dwindled to around 25,000, only about 0.26% of today’s population of 9.4 million. The key question is whether the former Jewish population is included in state narratives about the link between the past war and contemporary society. The answer seems to be yes, but not directly and not specifically. As in the Soviet period, Jewish deaths are simply added to the overall losses. If one includes the Jewish population, and deducts the largely non-Belarusian contingent of POWs, then Belarus likely lost a maximum of 1 million inhabitants during the war, or about one-ninth of its 1940 population. In his speech to veterans on May 9, 2013, however, the president repeated the mantra of one in three deaths among the “Belarusian people” and then lambasted those who try to reexamine the history of the war. He made no reference to the Jewish Holocaust. Similarly, on 3 July, Lukashenka declared that as a result of an “inhuman genocide, the country lost one-third of its population”. Thus the term genocide was applied to human losses without any specific mention of the destruction of one of the largest Jewish populations of Europe. Moreover, even the reference to “freedom” was inaccurate since the republic in its current borders was not liberated from Nazi occupation until 28 July, more than three weeks after the recapture of the capital Minsk. The enormity of the war on Belarusian lands cannot be denied. Belarus is a key part of what Timothy Snyder has deemed the “bloodlands” of Europe between Hitler and Stalin. It also suffered other losses: NKVD executions in 1937-41 of Belarusians, Poles, Jews, and others (bodies of Baltic soldiers found at Kurapaty, for example); deportations in 1940-1941 and after the war; about 400,000 sent for forced labor to Nazi Germany; the flight of people from the Nazis in 1941 and the Red Army in 1944; and the 1944-53 anti-insurgency operations of the MGB-MVD against an estimated 70,000 “terrorists” made up of Belarusian “collaborators,” the Polish Home Army, and the Ukrainian Insurgent Army. The BSSR was divided under Nazi rule: the Nazi occupation regime did not even recognize a separate Belarusian region. The republic also suffered the loss of Vilna (Vilnius), Bielastok (Bialystok), and other areas through the Nazi-Soviet Pact and the postwar settlement between the USSR and Poland. Precise figures on population and losses are practically impossible to adduce. What one can say, however, is that an official narrative of the war based on the loss of one in three inhabitants of Belarus is a myth as false as the general’s uniform that the president wears to military parades. Those who have pointed out this and other fallacies are castigated as “historical revisionists” who malign the state and the memory of those who died for it in 1941-45. The truth, unfortunately, is always the first casualty when reinventing the past. On 6 July Aliaksandr Lukashenka visited a celebration in his village of origin Aleksandryja in Mahilioŭ region. There he admitted that he very much looked forward to visiting his native land during his pressing schedule. “I travelled around the world, but have always wished to come back to my own land”, he said. 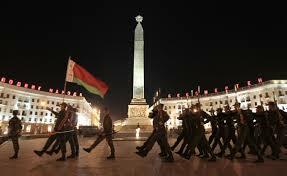 In Belarus politics, Mahiloŭ region is associated with its most famous figure – the present ruler of Belarus. Here, he spent his youth and gained his first governing experience in administrative and agriculture management positions. During the early years of his presidency, he promoted his fellow Mahilou residents to high offices in the government, as they were the only people he could trust then. Apparently, the region has greatly influenced Lukashenka’s identity and politics. It lies in the east of Belarus on the border with Russia, and is, for all appearances, the least Belarusian-speaking in the country. The region always shows up as the the strongest support base for Lukashenka during presidential elections. Mahiloŭ suffered greatly from the Charnobyl disaster and today around 30% of its territory is still contaminated with radiation. Mahiloŭ region stands out among other Belarusian regions – it is the native region of Aliaksandr Lukashenka. He was born in Kopyś village on the border of the Vitsebsk and Mahiloŭ regions and spent his early life in the village Aleksandryja. He studied at the Mahiloŭ Pedagogical Institute and Horki Agrarian Academy, also based in this region. His early worklife proceeded from here – he was a secretary of the communist youth organisation Komsomol in the town of Škloŭ, and then went on to head several collective farms. Here, he started his political career as a deputy of Škloŭ constituency to the BSSR representative body – the Supreme Soviet. In his early years of presidency, when the regime was still weak, Lukashenka suspected everyone of disloyalty. Therefore he used to appoint to high positions those people he knew well and who he had worked with – his countryside compatriots from the Mahiloŭ region. One of them, Ivan Ciciankoŭ, a notorious figure in Belarusian political history, served as one of the outspoken suppporters for Lukashenka’s electoral campaign in 1994 and afterwards was appointed as the head of President’s Property Administration, the agency which runs a number of state-owned businesses. The companies which President’s Property Administration created under Ciciankoŭ had unprecedented privileges and, allegedly, even operated by illegal schemes. This issue in particular concerns primarily import operations, where the companies received exclusive rights. Ciciankoŭ became the enemy of nationally-oriented Belarusians when after the 1995 referendum, which changed the state flag of Belarus, he personally removed and torn the red-white-red flag from the roof of the House of Government and put his signature on each piece. The pieces were subsequently sold as a rare item. However, Ciciankou did not stay long in the Belarusian system and already in 2000 turned up as the head of a department in the Russian gas company “Itera”. Another of Lukashenka’s college fellows, Uladzimir Kanaploŭ served as Lukashenka’s aid from 1991-1994, then held a seat as a member of parliament and the speaker several times. He also retired from high politics and today heads the federation of handball, which also turns out to be a rather good position in scheme of the modern Belarusian system. Aliaksandr Radźkoŭ, also a representative of the Mahiliou clan, has stayed in the game and currently holds the position of deputy head of the Presidential Administration. Earlier, he served as the Minister of education beginning in 2003. He is the leader of “Belaja Ruś” – the pro-Lukashenka civil association which was intended as a party of power like Putin’s United Russia, but Lukashenka has not yet granted it such a mandate. Mahilioŭ appears the most Russified region of Belarus – only less than 20% of its population speaks Belarusian at home. The region has always been the major supporter of the homegrown Lukashenka, which can be seen from the map below. The head of Mahiloŭ region, Piotr Rudnik, presents a rare example of a high official with foreign education – he has a degree from Dresden Technical University. He made his career at various industrial enterprises in Mahiloŭ (city) and in 2008 was appointed head of the region. Mahilioŭ is one of the two regions most contaminated with radiation as a result of the Chernobyl disaster. Almost 30% of its territory today still has various degree of contamination. Around 7% of population of the region had to move to other regions of Belarus because of the contamination. Many villages were completely buried underground because of the high levels of radiation. Babrujsk is the second largest city in the region and a big industrial centre. Its claim to fame is that of being the most criminalized city in Belarus according to official statistics. In the 19th and early 20th century, Babrujsk was one of the centers of the Belarusian jewish community, who made up around 70% of its population. It had 32 synagogues and many Jewish organisations. Although World War II and postwar emigration drastically decreased the role of Jews in local life, it remains perhaps the most well-known Jewish city of Belarus. Synagogues, Jewish clubs, schools and newspapers still exist here. Babrujsk and its jewish legacy appeared in the middle of a scandal in 2007, when Lukashenka at a press conference pronounced an anti-Semitic phrase: “If you were in Babrujsk, you saw how it looks like. It is scary, it is like a pigsty. It was largely a Jewish city, and you know how Jews care about the places they live in.” This speech resulted in the condemnation of the Israeli Ministry of Foreign Affairs, which summoned the Belarusian ambassador to express their concerns. Apparently, Mahiliou region, its culture and identity deeply influenced the phenomenon of Aliaksandr Lukashenka. Unlike his 1994 election rival, Belarusian-speaking pro-European nationalist Zianon Paźniak, Lukashenka presents himself as a product of a more Sovietised region of East Belarus. After winning the elections, he spread this culture to the whole of Belarus which strongly damaged the process of nation-building in the newly independent state.